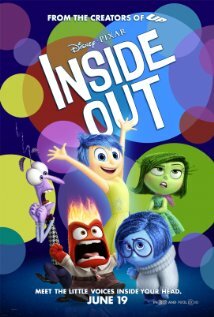 We all know Pixar/Disney has some great movies and let me tell you that Inside Out has to be one of the best.The theme here is that they take you to a world where your emotions take control of situations you're in and why in some cases it is needed throughout life and the obstacles we face. We begin inside the brain of a young girl named Riley (Kaitlyn Dias) and the emotions there: Joy (Amy Poehler), Sadness (Phyllis Smith), Anger (Lewis Black), Fear (Bill Hader) and Disgust (Mindy Kaling). Each one can take control of Riley in whatever situation she is in. The main emotion who is in constant command at headquarters is Joy and her job is to keep Riley happy at all times. Even though she is outnumbered she still tries her best to keep everyone in check. What is so great about this movie is that it shows how young kids and adults alike go through different stages of their lives and the ensuing emotions. Riley is in one of those changes because she moves from one place to another at the age of 11 or 12 and what she leaves behind is her life that she grew up on, including friends, school, and memories. All of a sudden, she has to start from scratch and try to make new memories with new strangers. Joy has a lot on her hands trying to make Riley happy as much as she can and with the help of the other emotions, including sadness it's the only way to get through it. Inside Out takes you on an adventure when Sadness and Joy get sucked up away from headquarters and must make it back or else Riley is under the control of emotions Anger, Fear, and Disgust. With those three you can see Riley is in a situation no one wants to be in. They explore through the mind and all that's old from all that is new in terms of memories and events, they go through dreams, facts, opinions and even imagination. You will enjoy what this movie has to offer and the message it sends. Inside Out is really a great idea and that's what makes it so unique that I wonder why it wasn't thought of before. A friend mentioned that now that they have done what goes through a young kid's mind, maybe they can make a sequel or sequels about different ages. Our emotions are a beautiful thing and making those memories is what life is all about. Take your family and make sure to get there early because they show a short film right before the movie begins. Stay a little after to see emotions from other people including some animals. Great touching story with a lovable cast and colorful animation, you'll love it.